We have had hundreds of people contacting us to say that they aren’t seeing our posts in their News Feed on Facebook. Having liked our ‘Cats and Kittens’ Page, where we post photos and videos every day, a lot of you thought that meant that Facebook would show you all our posts. But, sadly, it’s not the case,. Facebook only shows most people 1 in 30 of the posts we make – or possibly even less. There is no perfect solution to this but there is one thing you can do to tell Facebook that you do want to see more of our posts in your News Feed. 1. Find the small grey ‘down’ arrow in the top right of any post. 4. From now on, you should start seeing more posts. 1. Go to the ‘Cats and Kittens’ page, and find the ‘Liked’ button in the header. 2. 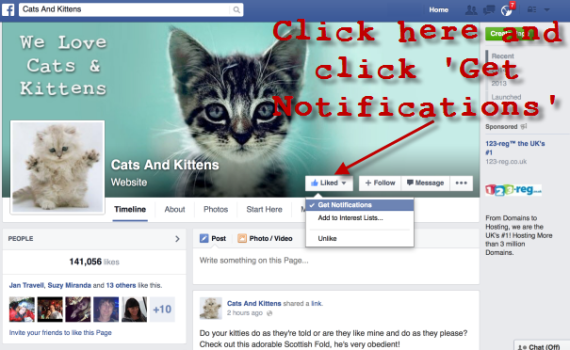 Click on the ‘Liked’ button and click ‘Get Notifications’. It’s worth pointing out that you might see slightly different options and this doesn’t always work on mobile. The most foolproof method is to go to our page on Facebook when using a computer and follow the second set of instructions above. Whichever method you’ve used, lastly – join the mailing list here. That way, even if you don’t see the posts on Facebook, you’ll get our weekly roundup email which lists the best posts from the week. AND you’ll go int to our monthly free giveaway which has so far handed out $728 worth of free cat goodies to our members. We hope that really helps and look forward to you seeing more of our posts every day!